Joya de Nicaragua and Drew Estate Introduce: Antaño Gran Reserva Presidente, a TAA Exclusive Vitola. Five decades ago, The Tobacconist Association of America (TAA), and also, Fábrica de Tabacos Joya de Nicaragua began operations. TAA is a group of selected tobacco retailers and specialists in the US and JDN is Nicaragua’s first cigar factory in operation and the referent of what it means to be the most Nicaraguan cigar. The New Antaño Gran Reserva Presidente was presented at the 50th TAA Convention that ran from April 29th to May 3rd in Casa de Campo, La Romana in the Dominican Republic. Luckily I was able to get my hands on a few to try out. When first looking at the cigar the box press style gives it a solid look to its construction. The wrapper is the color of light roasted coffee bean with hints of red that remind me of the clay in Colorado or maybe north Georgia. It is smooth with minimal veining and a matte oil sheen. There is a fair amount of firmness to the body but gives under pressure. The smell from the body gives notes of earth, leather and a bit of wet grass, from the foot the odors are more sweet and reminiscent of dried fruit with pepper lurking in the background. Since it is a box press I choose a V cut, the cutting process does not damage the cigar. The pre-light draw gives a light resistance and provides the usual rich tobacco flavor you would expect from the cigar. Lighting takes no effort and it burns sharp and even from the beginning. The draw has a medium resistance but not so much so that you feel like you are fighting with it. I produces loads of rich heavy smoke and leaves a tight light gray ash. The flavors are very earthy with a bit of nuttiness and perhaps a touch of sweetness on the finish. These flavors continued through the first half with no discernible changes. The construction remains prefect and the burn is razor sharp. Reaching the second half the flavor profile stays mostly the same a bit of pepper does sneak in on the finish adding a slightly new element. While the pepper notes are short lived the earth and nut flavors are always pleasant and enjoyable. The cigar continues to burn evenly with no construction issues that could be found. The smoke production is more than ample and delightful. 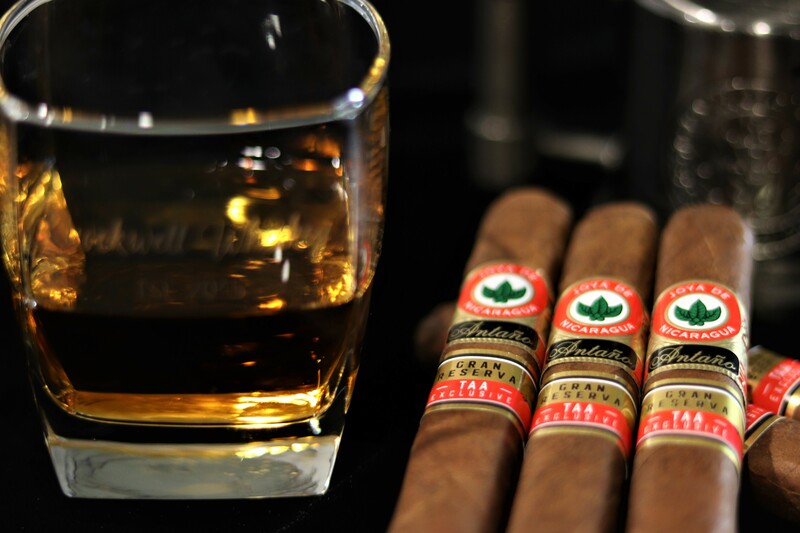 Dr. Martínez Cuenca, Joya de Nicaragua’s Chairman, and CEO said “When I requested the Gran Reserva blend in the Presidente size, it immediately became my private smoke. This is by far my personal vitola and the one that I request [from] the factory for my daily smokes, I decided to share it only for special occasions. I can’t think of a better opportunity than this shared celebration of five decades of perseverance and companionship between TAA, its members, and Joya de Nicaragua.” Joya de Nicaragua and Drew Estate are celebrating the 50th Anniversary of TAA, and 10 years of distribution partnership by introducing the Antaño Gran Reserva Presidente, exclusively for TAA. In all the cigar was a good mellow to medium smoke that, for the most part, had the same flavor characteristics that lasted throughout the entire cigar. While most people tend to go on about a cigars complexity sometimes it’s nice to sit down and have a cigar keep the same flavor profile for the duration of the smoke and this cigar did just that. I can see why this was chosen as Dr. Cuenca’s daily smoke, it is easy on the palate, has a great flavor from the beginning and no surprises halfway through. This cigar good easily be enjoyed by rookies and seasoned smokers and with its mild to medium body it would pair easily with any beverage of your choice. With it’s great construction, great burn time and great flavor I would definitely recommend picking these up when you see them.